This chapter analyzes the demand side of electronic government (e-government) in Spain. 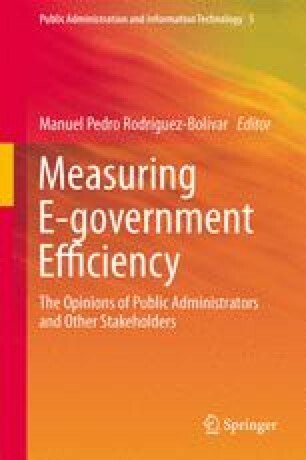 This chapter profiles the features of the users of e-government in Spain and the variables explaining their use of e-government services. In particular, this chapter tackles with the following questions: (1) Which factors predict the use of Internet by citizens? (2) How can the uses of and perceptions about e-government be described? And finally, (3) which factors determine the e-government usage? This set of questions is addressed with the study of national surveys of the Center for Sociological Research (Centro de Investigaciones Sociológicas) in Spain, using descriptive analysis, logistic regression, and the innovative technique of classification tree. The main findings of the study are the following: (a) the existence of sociodemographic variables to understand the lack of Internet use, (b) the complexity of the uses and perceptions of e-government users in Spain, and (c) the importance of the frequency of Internet usage to understand the e-government utilization.